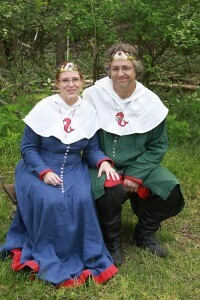 Our newest Baron and Baroness at their investiture. I made both outfits. 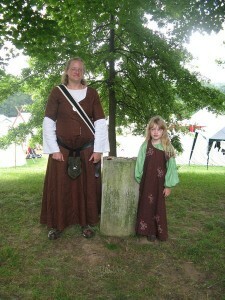 Baron and daughter with new clothes at Pennsic, did not make the Baronesses clothing. 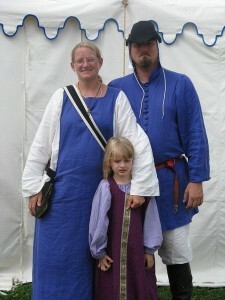 Helped or fixed everybody’s clothes in this Pennsic picture but the Baron’s hose. 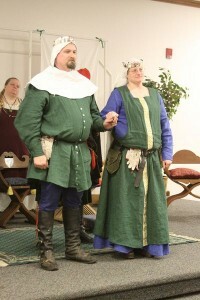 Sewed the previous Baron and Baroness’s court garb. 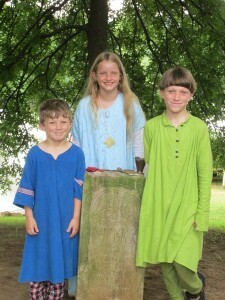 First style of children’s garb for 1350’s. It did not work well as a shoulder kept falling off. 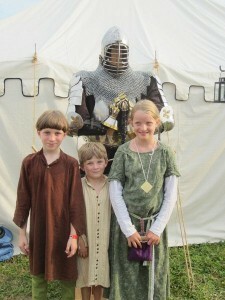 Updated patterns for the 1350’s for both of the older children. They work much better and the garb lasted for two years. Children grow like weeds! Note how the girl is starting to get bigger than my oldest son. She is only 3 weeks older than him. 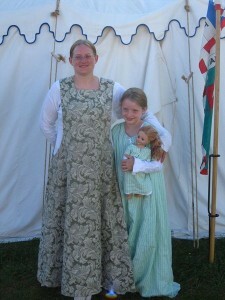 The last time I made her garb she uses 4 yards just like her mother’s dresses. When did that happen? 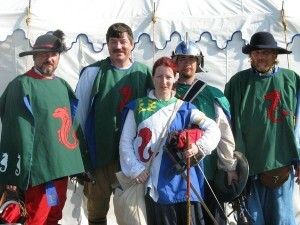 The Barony of Tir-y-Don has 10 reversible fencing tabbards. They are blue on one side and green on the other. 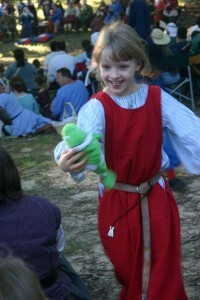 I sewed and appliqued a lot of them, but I did have some Baronial help. I made the champions tabbard for my husband and we passed it on. I like to barter. A good barter has both people thinking they got off with the better end of the deal. I bartered with a friend for baby sitting. She watches my boys, so we can go out to the theatre for a seasons worth of tickets and I sew for her daughter and her family. I could not be more pleased with the deal. I have collected a lot of photos that probably cover about 8 years in time. If you know children, then you know how quickly they grow. I try and make children’s clothes last for two years, but that has been hard. You can tell when the dress is new because the hem will drag on the ground yet a year latter it is too short. 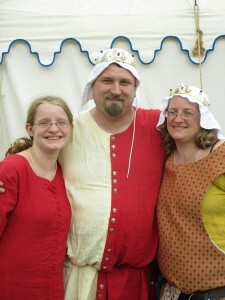 I enjoy sewing for this family because they have a girl and everybody in the family is the same time period. Plus they always say thank you.